8 SM Supermarkets and 2 Hypermarkets simultaneously launched the new Magnum Gold today at 3:00pm and I was one of the lucky few to get a first bite. The new Magnum Gold bar is coated with a delicious salted caramel shell, followed by an underlying layer of chocolate and then filled with creamy vanilla ice cream. Yum! Aside from me, 200 other customers also got free Magnum bars and a chance to win an iPod shuffle! All we had to do to qualify was buy something/anything of any value at SM Supermarket/Hypermarket. After me, hundreds of other customers followed suit and flocked towards the Magnum booth. I was watching from a distance while enjoying my ice cream when I heard a scream from someone who won an iPod shuffle. Lucky girl! 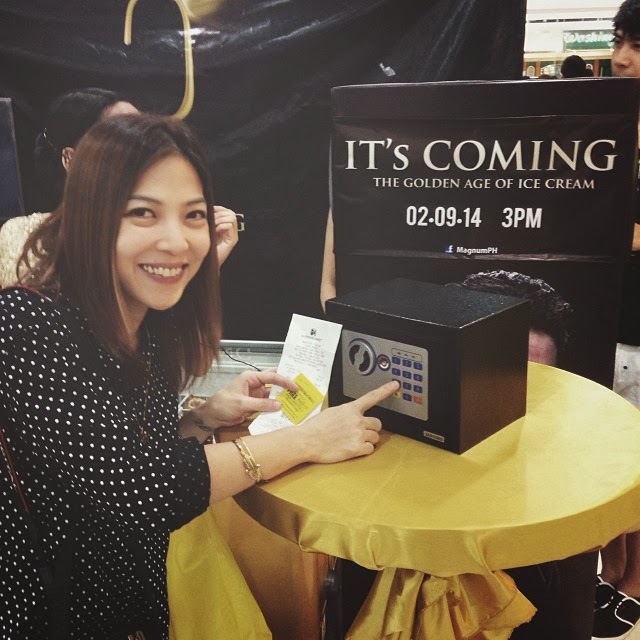 Aside from free Magnum Gold bars at the supermarket, 100 random cinema goers were also given a free first bite! If you missed out on this fun event, you can now also Grab The Gold at all SM Supermarkets, Hypermarkets and Savemore Markets in Luzon. And now for the GOLDEN OFFER! Beginning tomorrow til February 28, 2014 , Get 2 Magnum Golds for only P100!!! Nikola is so pretty na, babe! And this outfit reminds me so much of Clueless! Like you, I'm so awkward with outfit shots pero have to take one for the blog. LOL!